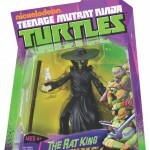 Last week, Toyark member ProfessorHov spotted new Teenage Mutant Ninja Turtles figures at retail. Now our readers and members are reporting in with their finds as well. The newest wave includes Rat King and Cockroach Terminator. Check your local retailers and stop by our Sightings Forum to let fellow members know what you’ve found! Read on to check out the images and the video.